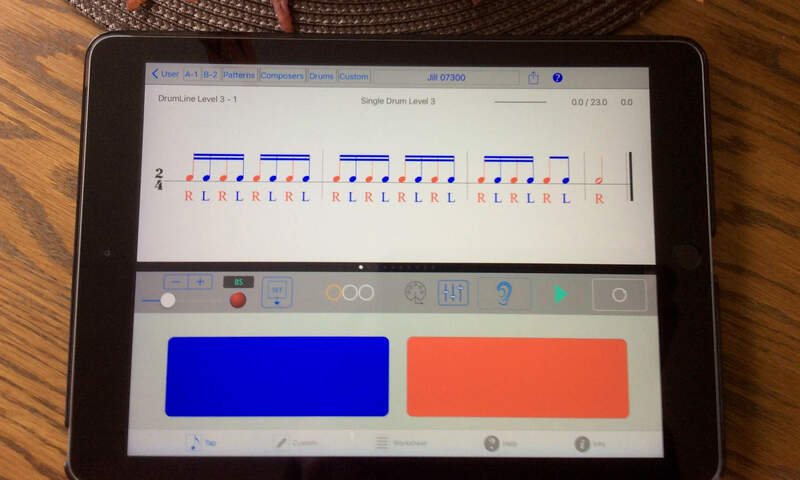 Rhythm Lab is a great app for developing rhythmic skills. 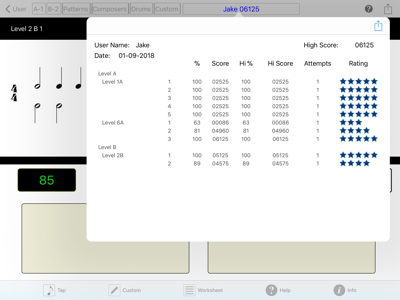 Rhythm Lab is an indispensable app for improving rhythm precision for students and musicians of all levels . Now with Rhythm Lab 3.2 you can change the color scheme on the Tap Screen. There are eight different themes to choose from. The theme options are easy to access and change – simply tap on the Settings button (gear next to the ear) and select Theme Options from the popup menu. Once a custom pattern is created, it can be edited and added to a custom pattern set. New custom pattern sets are easily created, or the pattern can be added to an existing pattern set. Custom patterns may also be saved as images for worksheets. 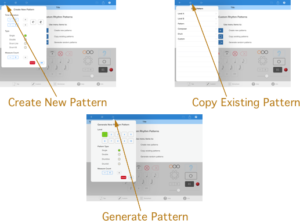 Custom pattern sets are immediately available for tapping on the Tap screen, and may also be exported and saved in an external app such as Dropbox, or emailed and stored elsewhere. Teachers can create custom pattern sets for students, tailored to the specific needs of the student. Users can save pattern sets off of the device and load or unload them freely. There are many great possibilities for using the custom pattern feature. Plug in a MIDI keyboard and Rhythm Lab will recognize it. For single patterns, any note-on event will register as a tap. For double or drumline patterns, the keyboard is split into two sections, with any note in the upper section recognized as a right tap, and any note in the lower section recognized as a left tap. Drum-kit taps are assigned to individual notes for hit, snare, and kick drum. Send MIDI note-on messages out to connected devices and other apps that receive MIDI messages. 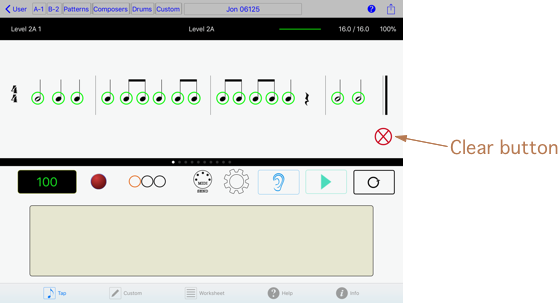 This feature allows you to use a wide variety of instrument sounds in addition to the sounds included in the Rhythm Lab app. The split-point note, drum-kit notes, and MIDI Send capability can be selected/changed on the MIDI Options menu. Rhythm Lab has an audio engine that is compatible with the Audiobus app. A large number of sounds, which conform to the General MIDI sound sets, are available and easily selected or changed via the mixer settings button. Since Rhythm Lab is compatible with Audiobus, tapping sessions can be recorded by other Audiobus-compatible apps such as Garage Band, and special effects such as reverb or delay can be added by using Audiobus-compatible Filter (effects) apps. Many audio apps are compatible with Audiobus, and a list of compatible apps can be found on the Audiobus website. Add an unlimited number of users to a single iPad (limited only by the capacity of the device). Manage users easily by adding or deleting them, or exporting / importing groups of users to cloud-based storage apps like iCloud Drive, DropBox, or Google Drive. The only requirement is a user name; no other personal information is required or obtained by the app. View scores and stats at any time by tapping the User button on the top right of the Tap screen menu bar. If you would like to use Rhythm Lab without logging in or tracking scores, you may log in as a guest user. Users logged in with a user name can see the results of their tap session immediately after a session finishes. Scores are awarded based on accuracy, with higher scores awarded for greater difficulty levels. Stats for individual users are available by tapping on the user button at the top of the screen. The highest scores for every exercise completed by the user are stored by the app. Tap settings and controls are accessible from the main tap screen. You can access mixer and user settings, including volume controls and sound options, by tapping a single mixer/settings button on the main screen. Metronome settings for BPM (beats per minute) can be saved for an individual exercise or for all exercises in a set. BPM (Beats Per Minute) settings range from 15 to 260 BPM for all exercises. Tap results – notes hit or missed – remain visible on the tap screen and can be cleared by the clear button (red cross in lower right corner). The results will clear automatically when a new tap session is started, but they will remain visible otherwise, even of the user scrolls to a different exercise.